Press steering wheel boss A. Pull stalk 1 towards you to flash the headlights. Move stalk 1 parallel to the steering wheel and in the direction you are going to turn it. 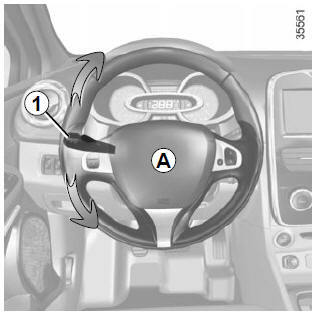 When driving, it is possible that the steering wheel may not be turned sufficiently to return the stalk automatically to its starting position. This switch activates all four direction indicators and the side indicator lights simultaneously. It must only be used in an emergency to warn drivers of other vehicles that you have had to stop in an area where stopping is prohibited or unexpected, or that you are obliged to drive under special conditions. 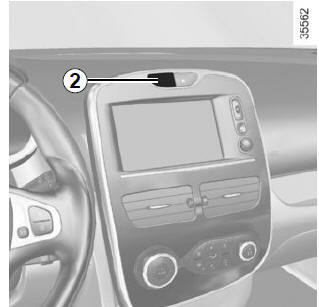 Depending on the vehicle, the hazard warning lights may come on automatically under heavy deceleration. You can switch them off by pressing switch 2 once.